Getting cold again. After 50 yesterday it was dropping into the 20s. The garage floor was cold. 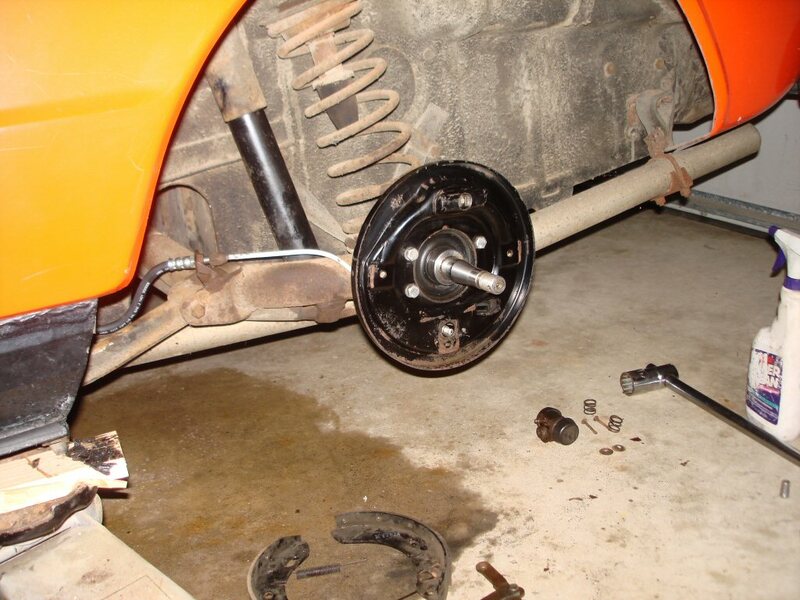 We decided to finish the brakes on the back left wheel. What we noticed that overnight the Sonett decided to pee all over the floor. When we left the flexible hose open, it drained all of the fluid from the master cylinder on the floor. Oh well. We still have not obtained a Sonett manual yet. The guy we bought one from told us last night he didn’t have it. Nice. Now we have to find another. It took a little time to get the drum off. We did back out the manual adjuster all the way but there was a rust bead around the drum. Once off, we could see that the inner workings still looked pretty nice. When we went to turn the slave cylinders cups, they were frozen as were the flexible lines. Interesting to see that the rear metal line was painted white. This appears to have been done at the factory. Maybe it was some type of rust prevention. Another odd item was the copper bleeder valve. I can’t say we ever saw a copper one before. The bleeder has to be removed to allow the slave cylinder to come out. 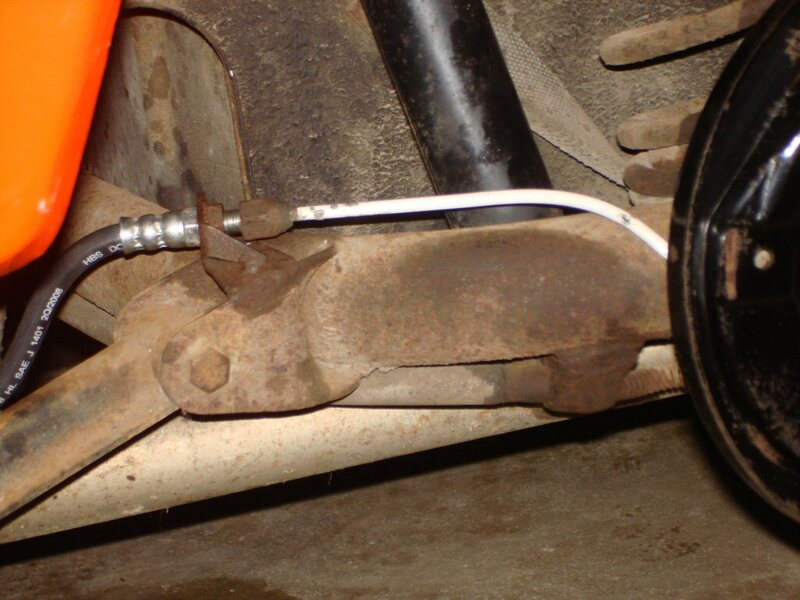 Also, we loosened the metal brake line but pulled the slave away from it so that we didn’t have to bend it. Everything came out easy. We cleaned everything then started assembly. Everything went OK except for the clip on the back of the slave. It was a real pain to get the cuppped clip around the anchor and then seat it. Glad it was all together. The drum will have to be taken out for a kiss cut. Without a manual I couldn’t figure out how to remove the bearings. They are pretty stiff with the old grease. The carb kit and what I think is the deceleration diaphram (listed as accelerator diaphram) came in at Napa today. I stopped and picked them up on the way home from work, about $40 with shipping. Took a look at the master cylinder. I was going to rebuild it but it was dry on the inside boot and held pressure so we are going to leave it along. 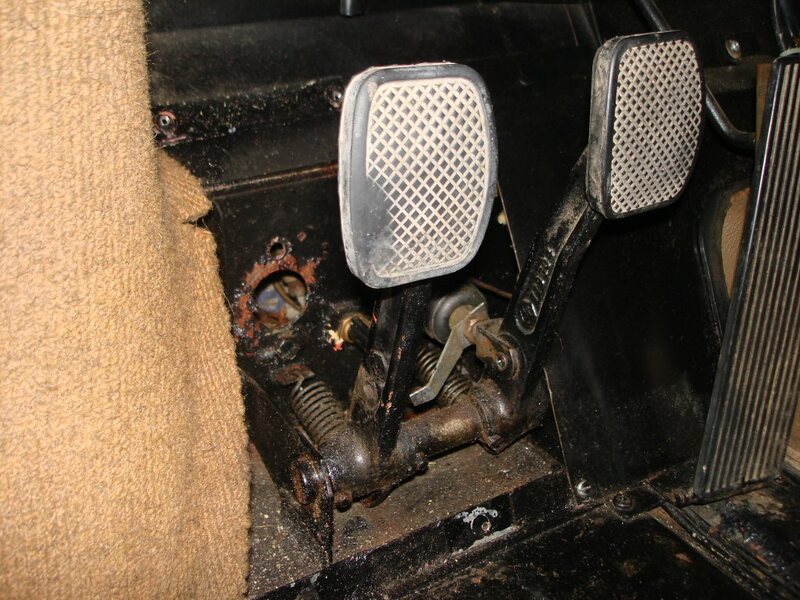 Kind of concerns me that there is a switch to show if the brake pedal over travels. 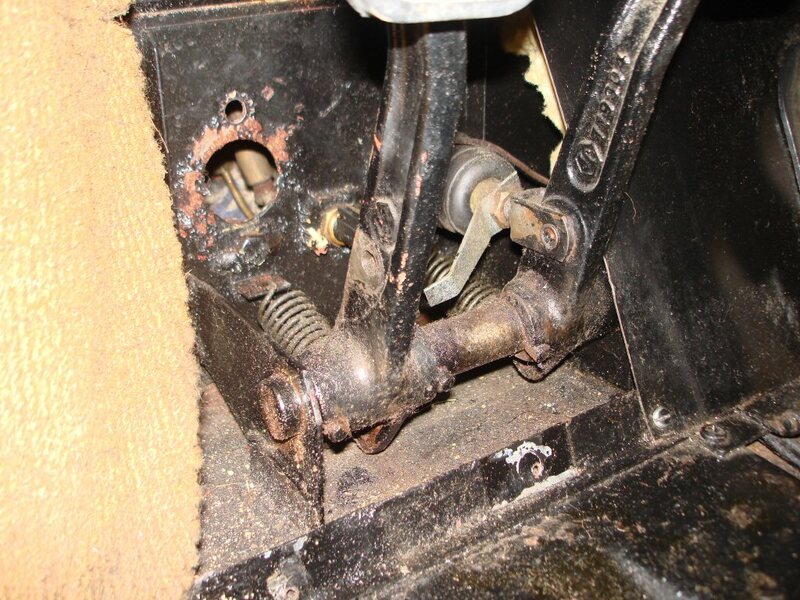 You can see the switch in between the pedals and the tap from the brake arm that would activate it. Maybe this means we will be back in here……. I also decided to see how easy it was to replace one of the flexible rear brake hoses. One connection was tucked nicely behind the drivers seat. It came apart easily and I fed the new line up from the bottom. I will do the wheel end later. Slow day today. Checked over the brake master cylinder and we thing we will pull it. Even though it seems to work it would be a shame to put everything back on and then have to take it apart in a month. 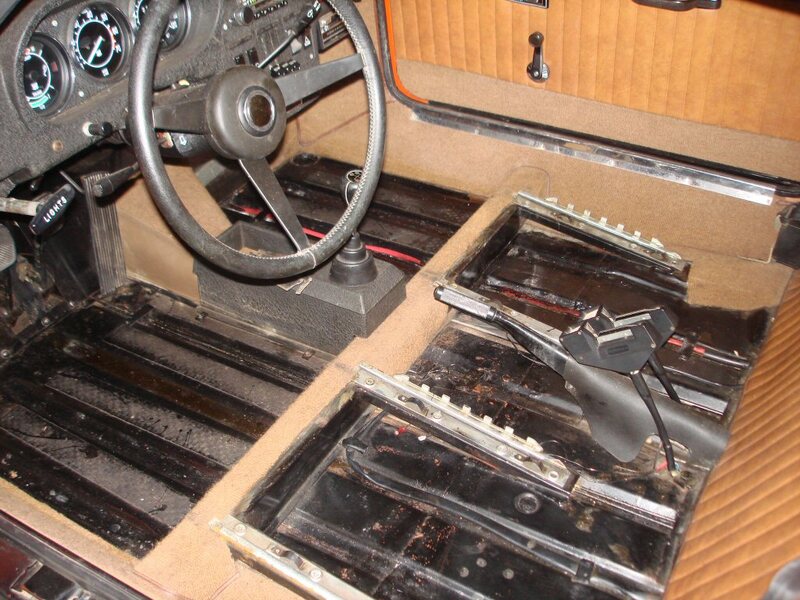 We’ve read that it is a tough job but with the clutch master our of the way, it does not look too bad. We will see. Got some responses that the Sonett should only have a jack in a bag. Certainly there is a jack in a bag with this car, I’ll have to check it out now in more detail. 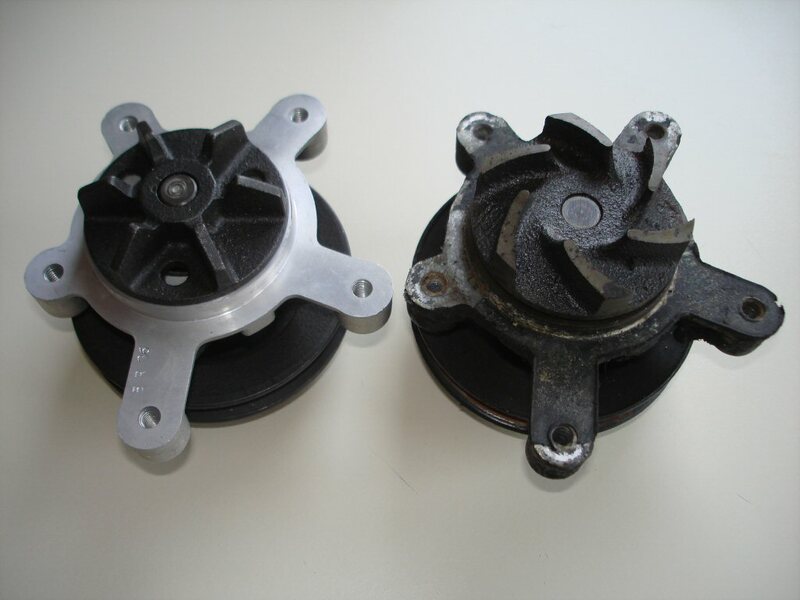 Looks like we will buy a Meyle pump that has spirals cast on the impeller. Even though it might not be machined like our original it just seems better. We will keep the other as a spare for road trips, so we don’t get stranded. Seems like the place that said they had an original V4 manual was wrong, they didn’t have it any more. We are still looking for an original V4 manual. Luckily, the Sonett came with the factory Sonett supliment book. Thanks Perry. Perry sent us the original title that he had for the Sonett. Aparently he had to file for duplicate at some time and did find the original. I have heard owners of other antique cars filing for duplicates so that their originals don’t have to be turned in. Once I bought a 1914 model T with a 1927 title. It really made me feal bad that it had to be turned in and scrapped! Spent some time on the carpets. Being a wool carpet they were a little fuzzy (like a wooly worm). Karen had a great tool to remove fuzz from sweaters. It was battery powered and if you move it slowly over the material and it lightly shaves the fuzzy strings off. Gives is a nice look. The tool does not get in to corners well but over all it was nice finish. is there a tool kit? Some rebuild parts came in today for the clutch system It took about 1/2 to assemble the already clean slave and master cylinders. It was tough to get the boot over the shaft and washer for the master. It needed to be warm and lubricated with the rubber grease. We went to look for hoses for the Sonett today and I blew a rim on the Van. These Ohio potholes are nasty in winter watch out (maybe like you can flatten a tire and bend a rim…)! Other than that nothing happened for today. Yet another day with little mercy for the poor Sonett. 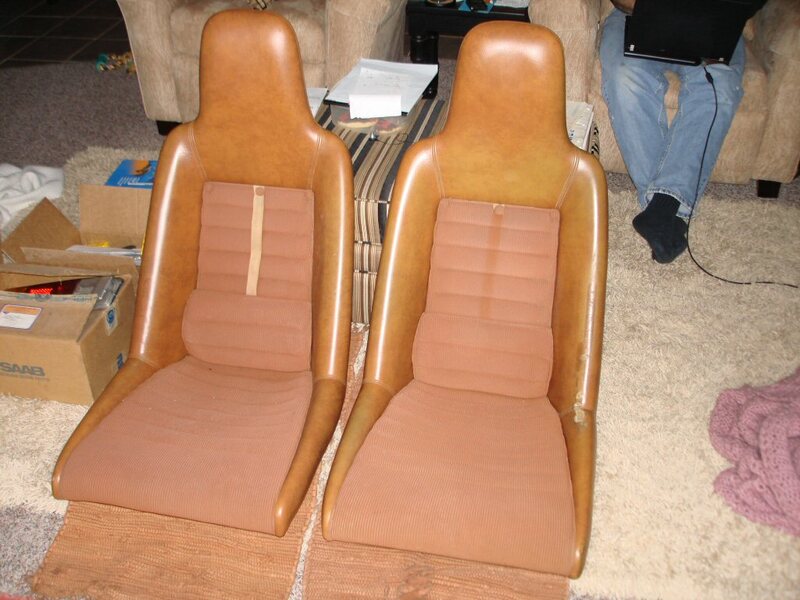 Today she lost her seats to be cleaned and fully inspected. To our suprise both seats are identical with the adjustment being on the right side. the driver’s seat is numbered 35699 and passenger seat is numbered 35692. The only damage to either seat is the driver’s side from regular wear, other than that no pealing or coming unattached anywhere! 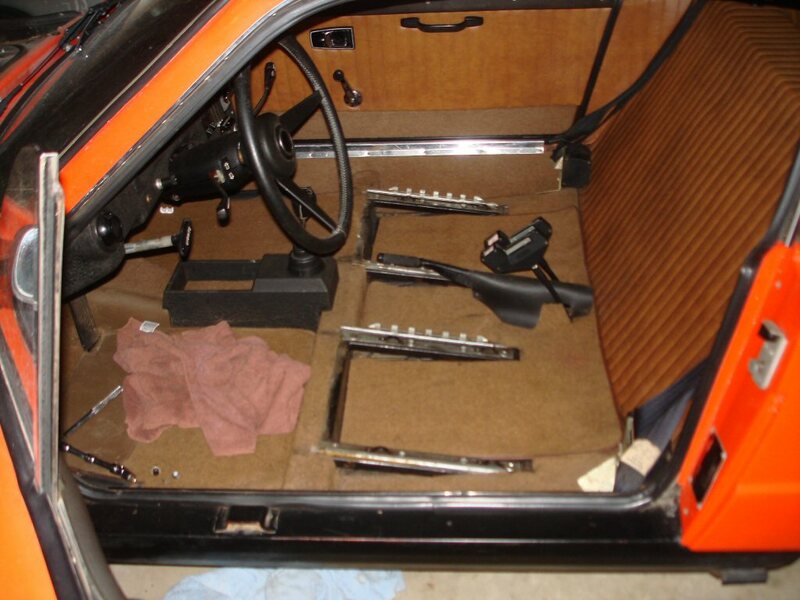 The lumbar slider may have not been on the drivers seat but it is tied in a bow around the seat frame. Couldn’t wait for the new plate to come in so I went to the Ohio BMV site and made one. I am burning another day of vacation to work on the Sonett in 20 degree weather. This will be good trainig in case I ever have to work on a Snow Cat in Antarctica. 3 cups of coffee later, I am caught up to most of activities including shoveling the driveway. Adam needs to fill in the details with some pictures. Found a link this morning to a GT40 Saab Sonett. The hand creation in amazing. Karen and I drove up to Northfield to register the Sonett and transfer the title. We got hit for about $300 in tax. I asked if Obama’s stimulus package included tax relief for transfering old cars and the teller just laughed. I took that as a NO. When we went to get license plates (something that is really needed for a car that doesn’t move yet) we decided on a vanity plate that would represent the car well. 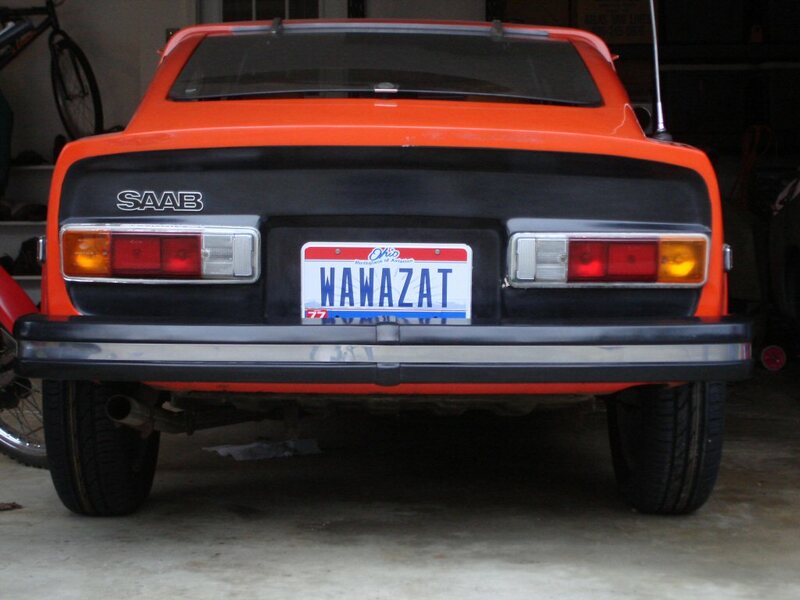 We chose “WAWAZAT” as we’re sure this will be the common response from other motorists. Well, somebody had to do it. Even with my 6 ft, 210 lb frame, I decided to tackle taking out the clutch master cylinder. On-line it sounded like it wasn’t for the timid. First, I started with two cups of coffee. It is only about 20 degrees outside right now. Our garage is not heated. I was going to lift all of the carpet out but I was able to get is off over the clutch pedal enough to remove the clevis pin. The plunger for the master cylinder stays in the unit (not like Karamann Ghias where it just pulls out). I was also able to take off the the top nut which holds the master cylinder on. I didn’t even have to put a stubby wrench on the other side to hold it. Note: “Something easy is always followed by something hard”. I went on the other side of the firewall to locate the unit and wrench it free from 35 years of hiding. Since I couldn’t get the cap off, or get the hose off the cap, I took the reservoir off. This left the hose attached to the master but that was OK.
Next, I took the line of the slave cylinder. I use a line wrench which is like a boxed wrench with a slot on the end. The slot lets the line pass through it and you get most of the leverage of a boxed wrench (don’t want to round anything off). But first (like in MASH when they were going to cut the wires to a bomb) put some penetrating oil on the hard lines. This will allow the nuts to slip on the pipe without twisting it off. I could not get the line on the master free so I left it on. The other day we removed the hard line to the left front brake so it gave us 2 mm more of freedom (well, a little more than that but you get the picture). What remains? It sure looked like the brake master cylinder and/or brake light switch would prevent the clutch master cylinder from coming out. All I did was remove the signal wires. The lower mounting bolt is acutally a stud which stays on the body. I used my 3/8 ratchet with two short extensions and a 13 mm socket. The long extension was too long. After about 10 minutes I had it off but I couldn’t get the lock washer off. If you don’t get it off it will hold the master cylinder on when it falls into one of the bolt threads. This was the hardest part, I guess if I had a magnet on a coathanger with 42 precision bends it might have been easier. Finally, my two hour wresting match was over. With the clutch master out, I put my cleaning gloves on. Now I could remove the slave cylinder line. I never freed the nut. It was seized on and I didn’t want to twist it off so I rotated the whole pipe around, the pipe was pointing at 10:00 when viewed from the side. The filler hose clamp came off even though the clamp was rusty. Now for the cap…… Not wanting to damage the finish I tried all kinds of stuff. Finally, I used a small screw driver to dig out the red seal. Then, I put the unit in a vice, wrapped it and used some large channel locks to open it. Nasty, some black remnants of brake fluid went everywhere. The good part was there wasn’t any corrosion inside the cup. The cap is a solid piece of machined aluminum, not your typical thin cap. For the next 4 hours I opened up the unit and cleaned it. I had to use some compressed air to force out the piston after I removed the white corrosion from the opening. The circlip ring channel was great and the bore looked nice so I ordered two rebuild kits (one was a spare….) from the PartsGeek. These parts should be in on Friday based upon their last next day service. 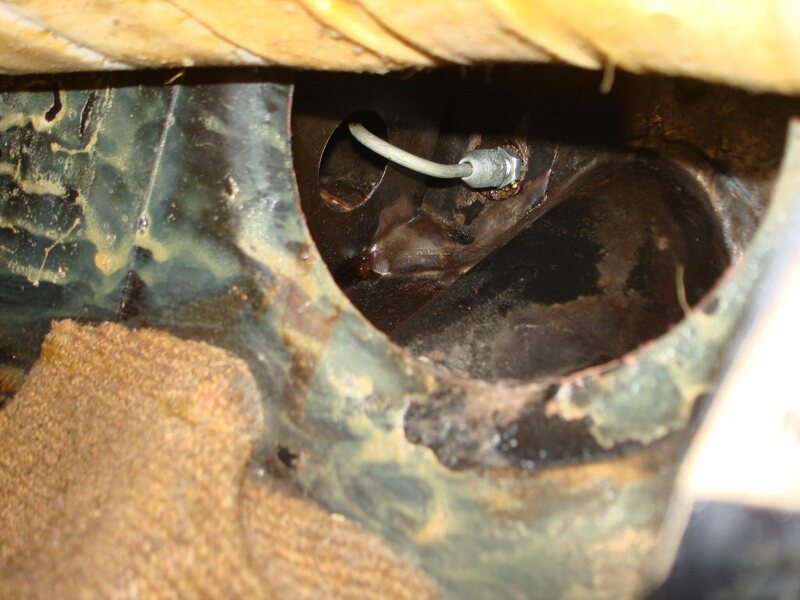 The prior owner, Perry, indicated that something with the clutch system did not work. 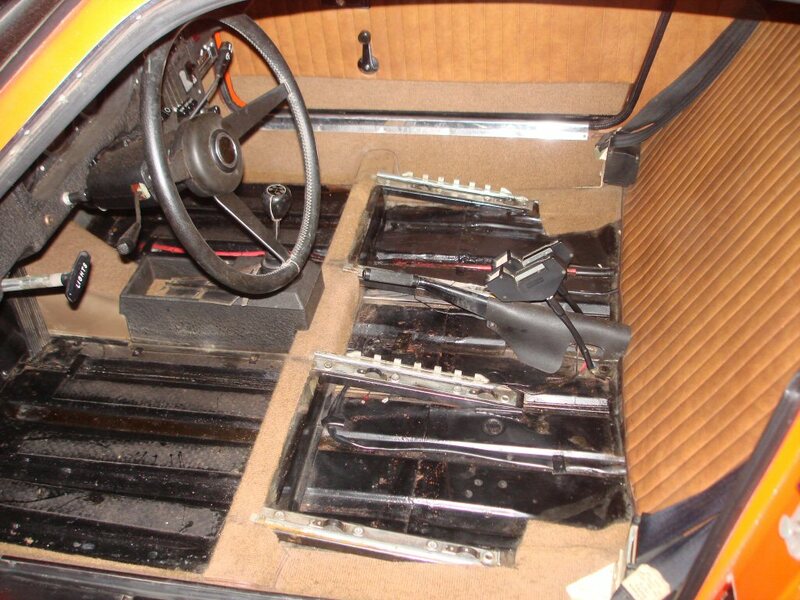 Having a TR6 before, I had an idea it was the hydraulics. The Sonett uses a hydraulic clutch like the Triumphs. No cables here. Much like a brake system, there is a master and a slave cylinder connected by piping. The slave is mounted right on the tranmission to move the clutch fork. Our lines looked to be OK but there was a lot of white aluminum corrosion under the boots which is not a good design. The clutch reservoir was also empty. So, we purchased a new slave cylinder for the clutch from Skandix for $98. We’ll pull the clutch master tomorrow to see what we have. It seems that the clutch master cylinder is the hardest item to find. It is only second to finding a master cylinder. When these components wear, experts like Ashcraft/Lamb/Scandix can take the unit and rebuild it. They will bore out the cylinder and then resleave it before using a new rubber seal kit. Do not hone cylinders as it will just enlarge the bore and your rebuild will not last long. A re-sleaved unit will set you back $200 to $400 if your core is rebuildable. Don’t you want to be able to stop and go after spending all this time and money on your Sonett? It seems that our brake master cylinder is ok. No leaks, reservoir bottle had fluid in it. However, our flexible rubber hoses turned into check valves. When you press the brake the fluid goes out but does not come back. The rubber lines swell over time and must be replaced. I used the PartGeek for most of these items. Back rubber lines seemed harder to find. We ordered new rear wheel cylinders and brakes too. For the front we went with new rotors even though ours were fine they were rusty and most likely needed a fine cut. We will keep them as spares. Even though the calipers seemed OK (no leaks) we bought the kit with the pistons ($40 ea) and new pads to assure nice smooth stopping power. Later we will see how hard these are to rebuild. While Adam was at school I took one brake hose off. It was swelled shut. What a pain to take off. The metal line came off the master cylinder and hose OK (I used a line wrench so nothing got rounded off). However, gett the hose off the inner fender was a treat, one freaking click at a time on the ratchet took about 10 minutes. I see lots of this in our future. Next I crawled until the rear, well kind of peaked in from the side, to see why these rear hoses are so hard to find. Didn’t look special at all. 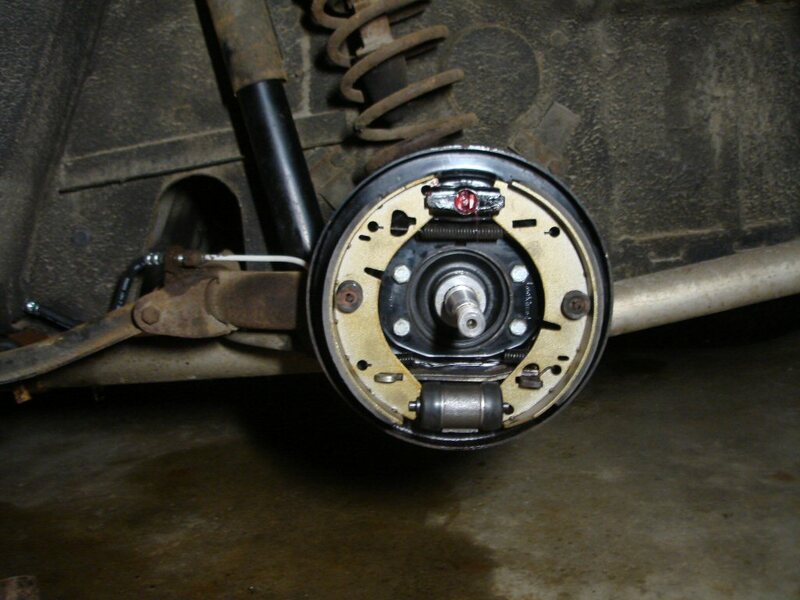 I’m just guessing most people don’t realize these go bad and therefore don’t have any rear brakes. We’ll see how hard these are to take off. Looks like they enter the cabin. Had to go to Skandix to get these. We’ll put up a parts list when Adam get done play “Tour of Duty”. After removing all of the hoses we decided to figure out if we could put them all back on. We drew up a water diagram to understand the water flow in the Sonett. Below is a picture. It appears that when the car is warming up and the thermostat is closed, not water flows unless the cabin thermostat is opened for heat. Then water would flow below the thermostat and through the cabin heater. Since the water pump is turning this water would flow back into the block. I’m not 100% sure buy I don’t think the choke would start to heat. It would need water from the heater to pass into it and that is not the normal flow. Hot water is to come out of the thermostat and divide back to the water pump and also divert a small amount through the choke heater (at least that is how I see it). One drawing in the manual show that on top of the block that holds the thermostat is a screw. This screw can be removed to bleed air out of the engine.